Your main objective as a business owner and Internet marketer is to make your site easy to use and functional for your customers. You want to make sure that there aren’t any obvious conversion traps, that you adequately answer all of their questions and that you let them use the site the way they’re comfortable using it. Your site, ultimately, should be about their needs, not your own. Internet marketing is all about delivering a satisfactory buying experience so that your customers are left with a positive brand image and will recommend you to their your friends. What you don’t want to do is annoy and alienate them. You don’t want to get in their way, act deceitfully or fail to deliver what you promised. Below I present you with some surefire ways to frustrate and drive away your customers, as demonstrated by my recent dealings with Verizon Wireless. Here’s what you don’t want to do. As a business owner, you should understand that your customers have options and that it is in your best interest to help them do whatever it is they want to do on your site, even if what they want sounds odd to you. For instance, I understand that I live in Southern California and that as of January of 2008, I will have lived here for four crazy years. But that still doesn’t mean you should make me adopt a California area code if I don’t one. If I want to keep my Long Island phone number for sanity and sentimental reasons, let me. Don’t make me have to conform or try and guilt me into doing what you want me to do. Because, as Susan will tell you, I’m not going to abide by the path you set out. I’m going to find the loophole that allows me to keep my Long Island phone number and I’m going to silently hate you for making me spend 20 minutes trying to figure out how to do it. It’s not your job as a company to tell customers what to do. It’s your job to help them do whatever it is they want to do and then get out of their way. Verizon makes a lot of money off of my inability to stay within my data plan. If it warms my heart to hold on to my 631 area code, so be it. People don’t like the old bait and switch. Your customers want you to give them all the information regarding a product up front so that they can decide if they’re interested in it before they make the emotional attachment. They don’t like to feel tricked. 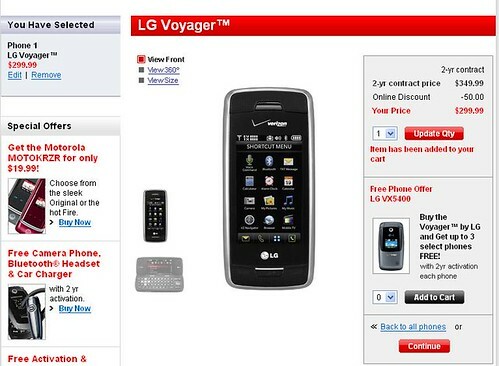 There were no prices mentioned when Verizon first began teasing the Voyager. This wasn’t surprising. I expected I’d see a price when Verizon was ready to sell, it would be far out of my price range, and then life would go on. Instead, when Verizon put Voyager on its Web site with a hard price, it looked like this. Eureka! I mean, sure they make you sign a two-year contract, but the listed price is only $349.99 and there’s a $50 online discount? I can totally afford that. Huzzah! I’m pre-ordering! As soon as I placed my order, I received an email to give one of the Verizon reps a call. I did and was quickly informed that the pretty price I saw was only for people who qualified for an upgrade. I’m still 6 months away from my upgrade date. For me, the price would be more like $500+ once the tax and fees were applied to it. Take a look at that image again. Is there any mention of the upgrade condition for that price? Is there any hint of what the full price may be? Mmm, bait and switch. Don’t try and trick your customers. If I’m looking at a $500 phone, tell me I’m looking at a $500 phone. You won’t believe how angry people get when you suddenly double the price on them. Funny how that works, isn’t it? I decided to go ahead buy the phone anyway (thanks to some father-produced financial assistance). I re-placed my order and within seconds had several emails from Verizon instructing me to give them another call. I did, I clarified a few things, and I began to get very excited over the super cool phone I was about to receive! Only, I’ll probably never actually receive it. Because when I was instructed to give the nice Verizon man my order number, I didn’t realize I had to give him all three. Instead, I gave him the original number, my name and the last four digits of my social, assuming he could look up my account and see everything they had sent me. Apparently not. Or maybe he was just as confused as I was. All I know is that by the time the mess got sorted out several days later, Verizon was sold out of Voyagers and I was told they "couldn’t make me any promises". To add salt to the wound, my little brother, who ordered his phone more than a week after I tried to order mine, was already receiving his shipping notification. Cue broken heart. Even if it’s their fault, don’t blame your customers for their failure to understand your Web site. You don’t have to fall on the sword entirely, but at least acknowledge that sometimes mistakes are made and promise them that you’ll your best to make it right. That’s really all your customers want, your promise that you’re going to help them meet the goal they were going for. Because you care about them and that they matter to you. When I tried to explain to the nice Verizon man that I was confused by the customer service process and that I didn’t understand that all three emails had to be reference separately, he quipped, "well, why do you think we sent you three?" Well, alas. I don’t know. Clearly, I am too dumb to do business with. Maybe I’ll give T-Mobile or AT&T a try. Your customers are your bread and butter. No amount of SEO is going to do you any good if you’re dropping the ball when it comes to giving customers what they really want, an easy to understand conversion path and a sense that their business matters to me. If you don’t care about your customers, however, please feel free to abide by the four rules listed below. Your competition will thank you. What a great list, thanks. Probably part of being deceptive by “being complex” is something that can really make your customers fly off the roof. I would guess a good majority of customers do not take the time to read the details, so making it VERY simple with clearly written policies is a plus.